14" (37 cm) Milliners Model w. Apolloknot. Rare model.Paper mache/papier machee with extremely rare hairdo with high Apolloknot and with fine brush strokes arround her face. Long slender neck and with kid body and wooden lower limps. Painted shoes.Original cotton with tulle dress off the shoulders. Lovely molded bust. The painting is outstanding and so is the condition of this old empire doll. Also lovely as a dollhouse doll in a large dollhouse.A doll of museum quality. 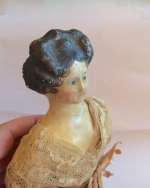 Antique "Queen Anne" or early "Georgian" , carved wooden doll. 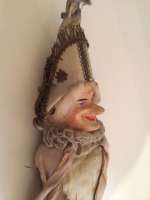 A charming early wooden doll in a very fine all original condition. 11,5" tall (28 cm) This young girl is a peg wooden doll with fine carved black painted hair with a carved curl at each side of her face and a bun at the back.. Her body is wooden, with a small waist. She is dressed in her original outfit -a lovely antique silk dress.Fine underwear. The Gesso layer is in perfect condition. Ca 1870 Excellent condition all over. Rare to find is an Early Milliners Model like this. She comes from a Museum and has been well preserved behind glass in her wooden case for decades. 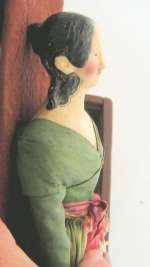 She has a Papier mache sholderhead, black molded and painted hair with exposed ears and long detailed painted curls and brushstrokes.Painted features with blue eyes, kid body with wooden arm and legs.Her clothing is all antique and original.Lovely green silk blouse,cream gauche skirt, fine underwear, painted shoes. A little band on her arm.H.14" 36 cm.Incased in a period glass front wooden case. 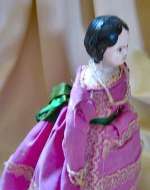 An excellent doll.. She comes from the Mary Merritt Doll Museum. 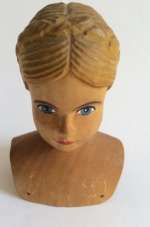 Brienzer Wood Doll´s head from Switzerland. Rare Large Size and All-Original Swiss Wooden Character Doll by Huggler 18" (46 cm.) Carved wooden socket head with well-defined sculpting of facial features,ears and hair,having brown hair with deeply-defined comb-marks waves from face and put in a braid at around the head in a typaclt german way. at the nape, painted brown thick black upper eyeliner,brown one-stroke brows,closed mouth. Switzerland, ca 1900. H. 8 cm / 3-1/2"
Antique Papier mache Doll:Milliners Model w. Apolloknot. 10" (25 cm)Milliners Model w. Apolloknot. Rare model.Paper mache/papier machee with extremely rare hairdo with fine brush strokes arround her face. Long slender neck and with kid body and wooden lower limps. Painted shoes.Original cotton with tulle dress off the shoulders. Lovely molded bust. The painting is outstanding and so is the condition of this old empire doll. Also lovely as a dollhouse doll in a large dollhouse.A doll difficult to resist. All-Original Autoperipatetikos mechanical doll with key. Patended in USA 1862. 28 cm /12". Autoperipatetikos mechanical doll. Ca 1860. This walking dollis a wonderful rare exampel of these dolls. She is all original and comes with the original key to wind her up. She has a paper mache head with fine painted features. Lovely pink dress trimmed with lace. All original. 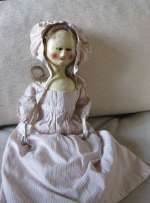 She has black molded hair with a hair band .All original and in great condition. The doll is on a cardboard base with the patent marking (see picture). Original key for wind up. 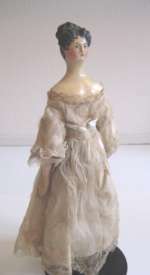 In the 19th century, there were many examples in making a walking doll. The most famous of these, patented in America in the middle of the century- was this kind of doll. They could be made to walk on their own either by being wound up or by the action of a lever. This is a great working examble.Wonderful condition. 28 cm/12" Tall All-Original Autoperipatikos original and functional condition Fully marked with original patent info on base. "Patented July 15th, 1862"